Manoeuvrability and versatility are hallmarks of a good brushcutter, and this is clearly a belief by which Honda abides. The UMK425 LE, for example, is a nimble but powerful straight-shaft brushcutter perfect for trimming intricate edges and borders with outstanding precision, but also powerful enough to make light work of thicker patches of overgrown grass, nettles and weeds. Powered by a clean running and fuel efficient 25cc GX25 mini four-stroke petrol engine, featuring an easy to use recoil start system for quick starting, the UMK425 LE offers two distinct cutting options. 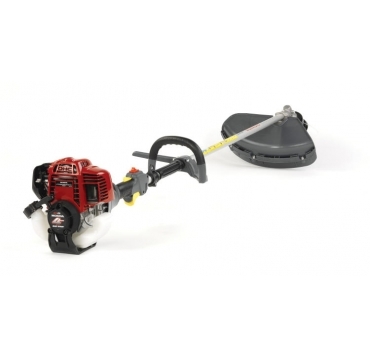 For situations in which precision is paramount, such as trimming overgrown borders, verges and lawn edges, the UMK425 LE is fitted with a powerful nylon line cutting head which will easily reach areas inaccessible to conventional lawnmowers. For added efficiency, the cutting head also features a handy tap-and-go line advancement system and durable metal line cutter which automatically cuts the nylon line to the correct length for optimal performance. When faced with tougher cutting jobs, however, the UMK425 LE also includes a tough, three-tooth blade to make it easy to clear rougher patches of overgrown grass, brambles and other scrub.